I started this blog post with a little disappointment since I have wrote 4 paragraphs of it, put it on draft and it’s gone! I must put the draft on the Microsoft Word first to avoid this kind of loss in the future (sigh!). 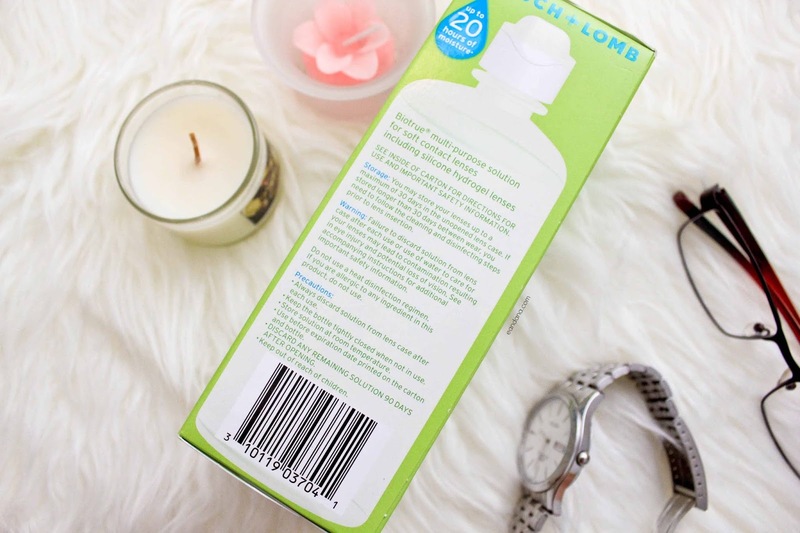 Well then let’s start with this empties that changed my night cleansing routine! My night time routine used to be just bi phase eye and lip makeup remover + micellar water/face wash. Little did I know, I put more makeup along the way and a mere micellar or face wash is not enough, I got pimple as the result! I realized that it is not just about how you put a good makeup, but it also on how clean your face after removing it. And that, my fella, force me to seek another option, which is cleansing oil. 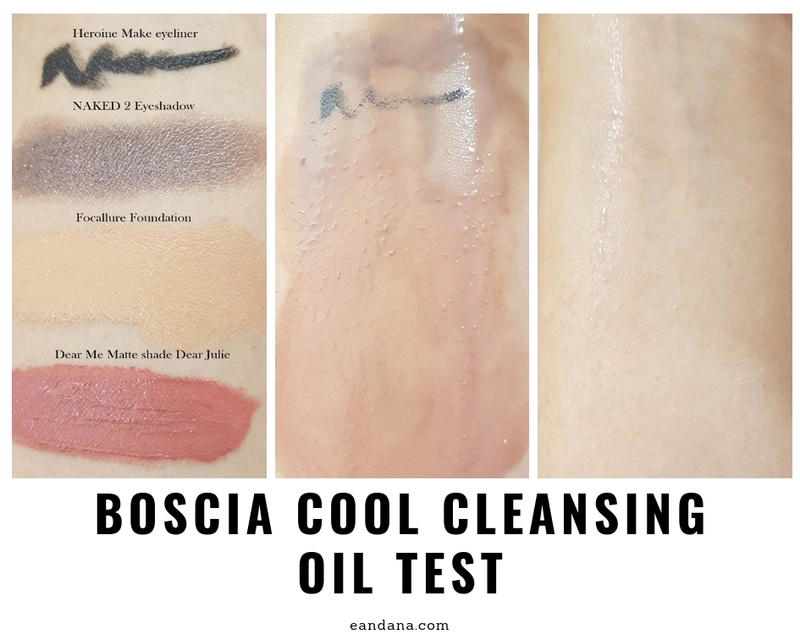 My journey on cleansing oil starts with Boscia Makeup Breakup Cool Cleansing Oil. I know, I know, the price point is a little high compared to Korean product. But here I just want to share my experience, as I have the opportunity to buy it in special price, lucky me! 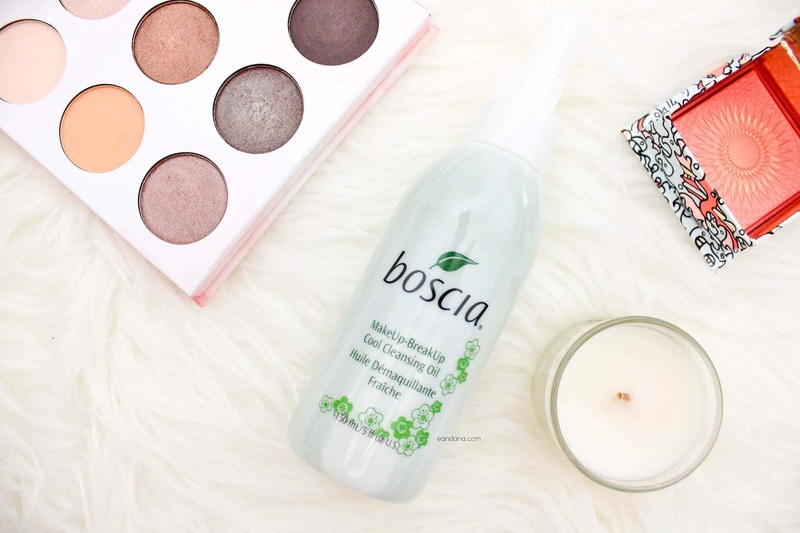 Melt away stubborn makeup and skin-clogging impurities with MakeUp-BreakUp Cool Cleansing Oil. Packed with anti-aging and hydrating skin nutrients like Green Tea and Rose Hip, this refreshing cleansing oil leaves skin feeling nourished and squeaky clean. boscia’s signature double cleanse ensures a perfectly clean slate. It’s a two-step process that ensures all makeup and debris is removed for a complexion that's as clean as can be. Remove stubborn makeup and dirt buildup by deep-cleansing to dissolve all the grime on the skin’s surface with MakeUp-BreakUp Cool Cleansing Oil. This oil-based cleanser really penetrates deep to dissolve any impurities. This nanotechnology blend of Rose Hip, Green Tea, Avocado and Olive Fruit Oil enables water to reduce the oil phase of this cleanser to micro-sized particles to rinse surface debris, and even waterproof makeup, away quickly and easily. hydration or treating acne. By following with a water-based cleanser, you are fully removing any excess makeup, debris or impurities from the skin’s surface, allowing your serums and moisturizers to properly absorb into the skin. Pro Tip: Cleanse your skin in the morning with Makeup-Breakup Cool Cleansing Oil before your daily cleanser to remove any dirt or oil from your beauty sleep! Apply to dry skin and gently massage onto the face in a circular motion. A unique cushioning effect will allow your fingers to glide without pulling or tugging. Add water to emulsify into a milky cleanser; continue to massage MakeUp-BreakUp into the skin and rinse clean with water. On my dry skin, this product did the job properly to cleanse the makeup residues without over stripping skin. Careful though, for you who has fungal acne, based on SkinCarisma ingredients check there are some ingredients that might trigger it. As for me I have to rinse it thoroughly and continue with next step which is facial wash. There was one time I purposely did not use facial wash afterwards, to see if it will add moisture and I end up got a pimple (gosh!). So make sure you rinse it off, right. I was advised by my beautician, to massage your face when applying cleansing oil. You might want to see this video for step by step face massage! It works wonder and soothe your stress skin. Moreover if you do it religiously, it can lessen the appearance of puffy face and contours face as well. The down side of this product is : it can't erase matte lipstick properly. 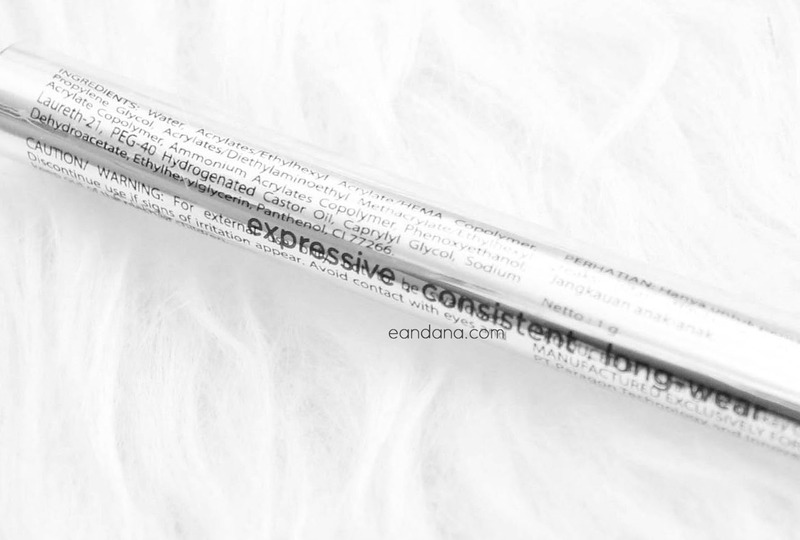 It can erase my eyebrow product but I still prefer to use bi phase eye makeup first for eye area, then continue apply this product. It did not sting my eyes (P.S. : my eyes are really sensitive). It has a slight green color and smells earthy. The smell is still acceptable for me who sensitive to smell. 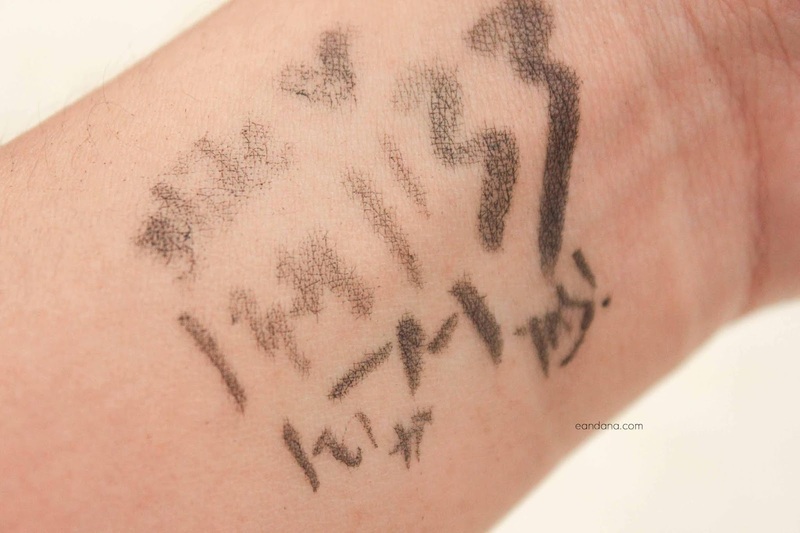 I tested on Heroine Make Eyeliner, Naked 2 eyeshadow, Focallure Foundation, and Dear Me Matte shade Dear Julie (which I haven't had time to review yet, review will up soon!). 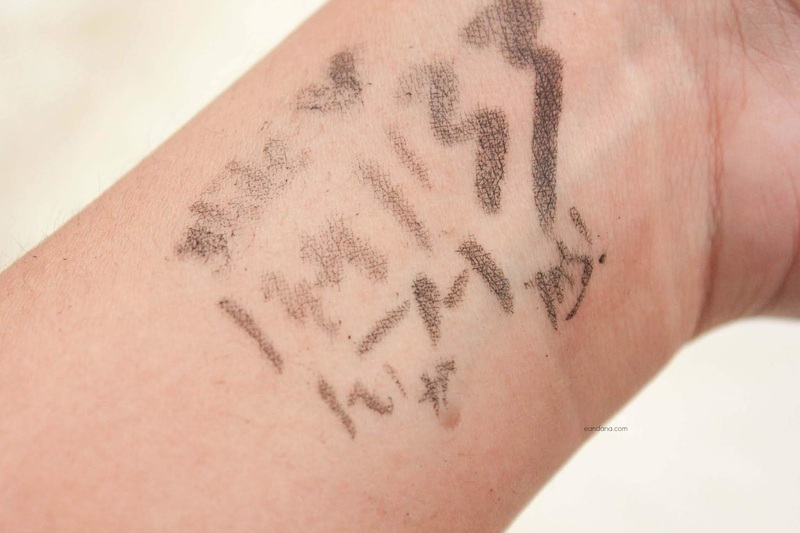 On second image, I rubbed lightly the oil and the eyeliner is the most difficult to clean. Meanwhile I personally think the Dear Me Matte shade Dear Julie that I own is a typical matte that is particularly easy to fade, hence the easy dissolve. The third image is final result after i add water and the oil is emulsify perfectly. Please note that I had to rub quite strong to remove the eyeliner which I will not advise to when you cleaning eye area. That is why I still prefer to use bi phase eye and lip makeup remover before applying this product. As for me it was a nice experience to use this product, a great starter and I will continue my journey to try another brand. Beberapa waktu lalu ada kebutuhan pemakaian contact lens untuk menunjang kegiatan sehari – hari, rencananya mau cari merk air contact lens yang berbeda dari yang selama ini dicoba. 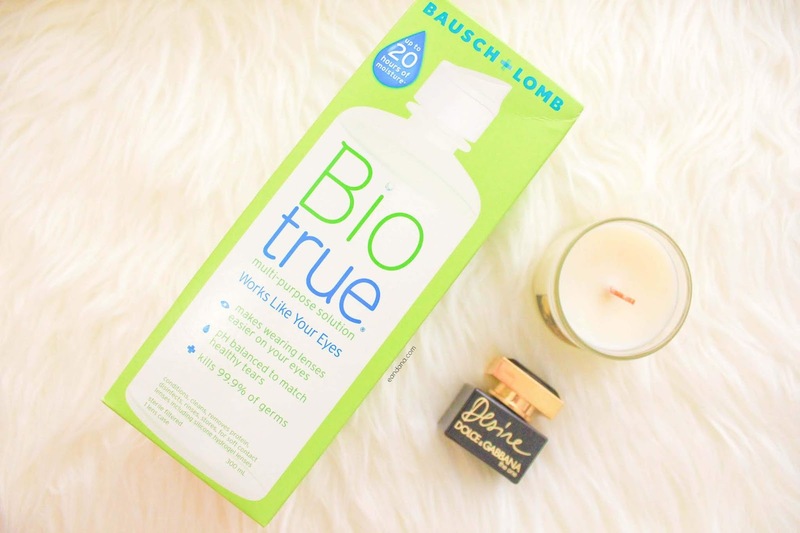 Akhirnya penasaran sama Bio True dari Bausch + Lomb ini. Jujur waktu lihat slogan pH seimbang yang sama dengan air mata yang sehat, asumsi cairan tidak perih di mata dong ya, hahaha. 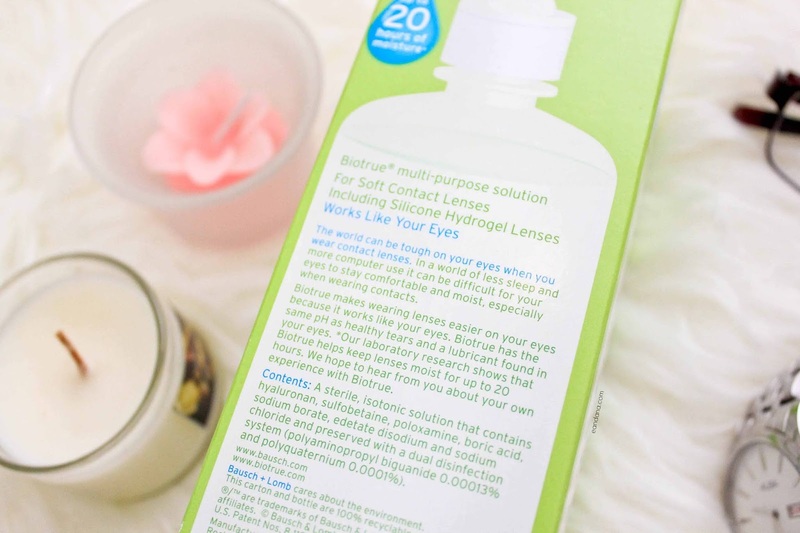 hyaluronan (HA) - Biotrue hydrates your contact lenses in the same way that your eyes naturally hydrate – by utilizing hyaluronan (HA), a lubricant found in your eyes. Same pH as healthy tears - Biotrue matches the pH of healthy tears and enables optimal performance of the dual disinfectants. 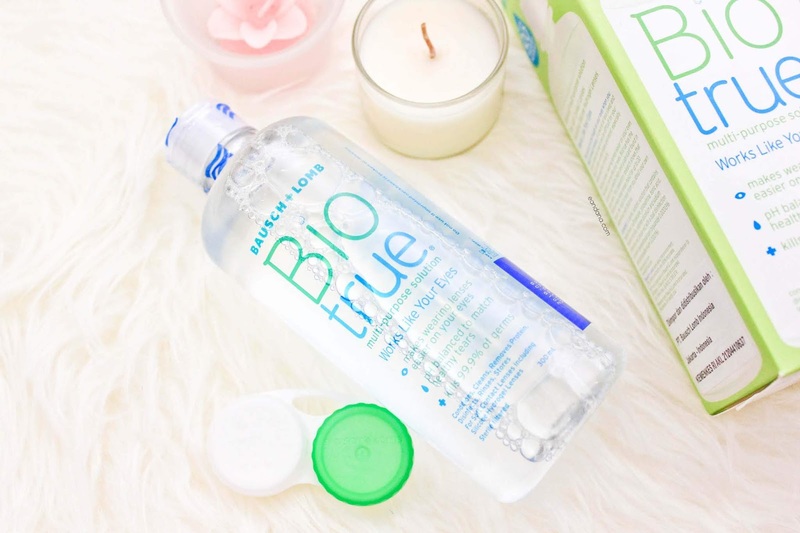 Beneficial tear proteins - Biotrue keeps proteins in their native state active as they are naturally in your eye. They act as your eye’s inborn germ-fighters. 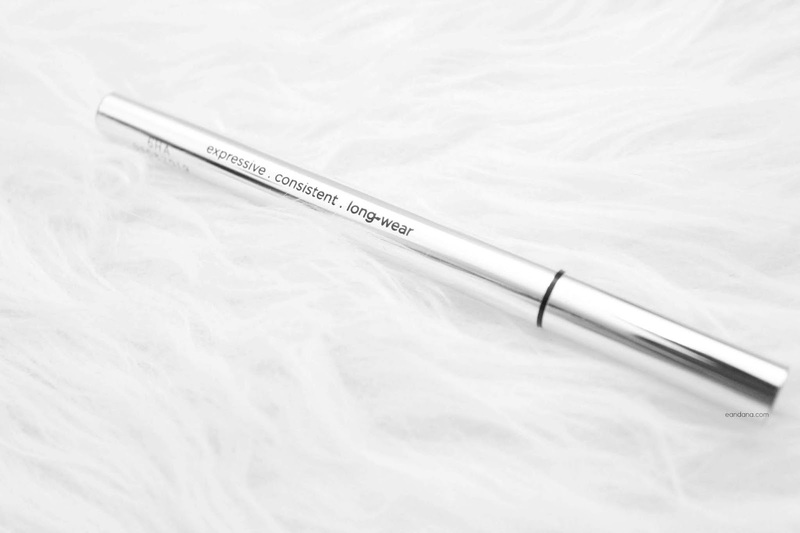 · Up to 20 hours of moisture. · Uses a lubricant found naturally in your eyes. · Matches the pH of healthy tears. 2. 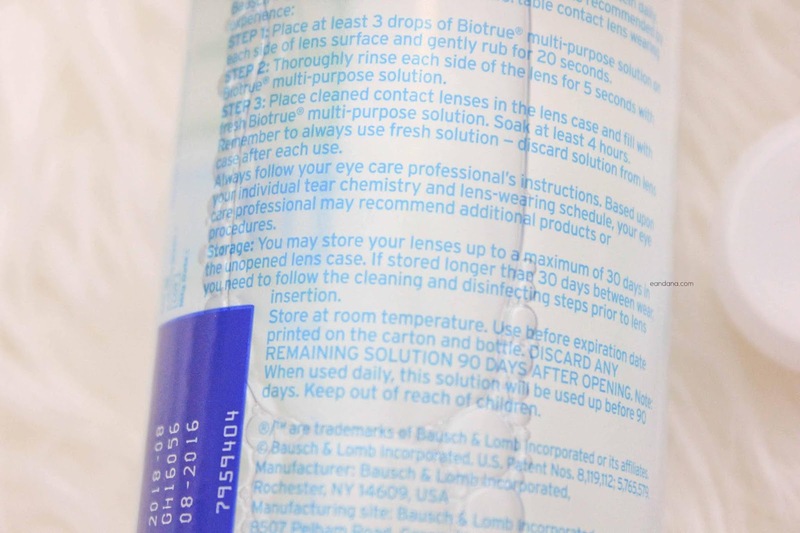 Thoroughly rinse each side of the lens for 5 seconds with Biotrue multi-purpose solution. 3. 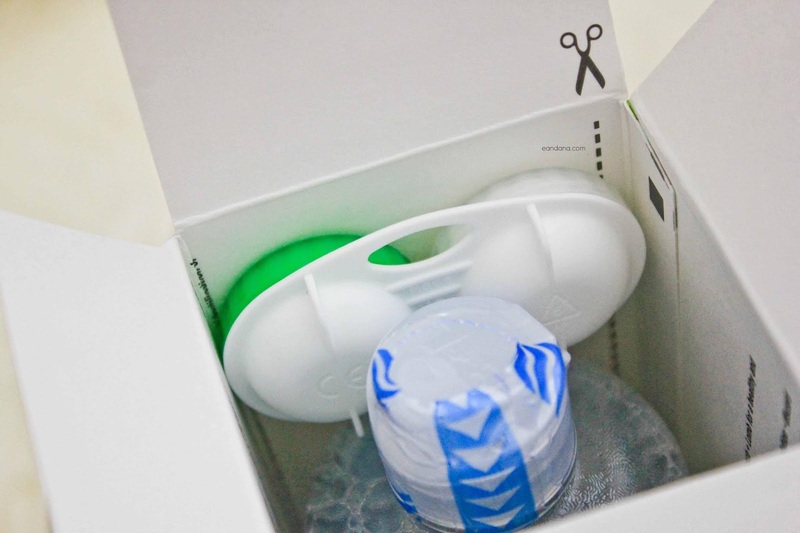 Place cleaned contact lenses in the lens case and fill with fresh Biotrue multi-purpose solution. Soak at least 4 hours. 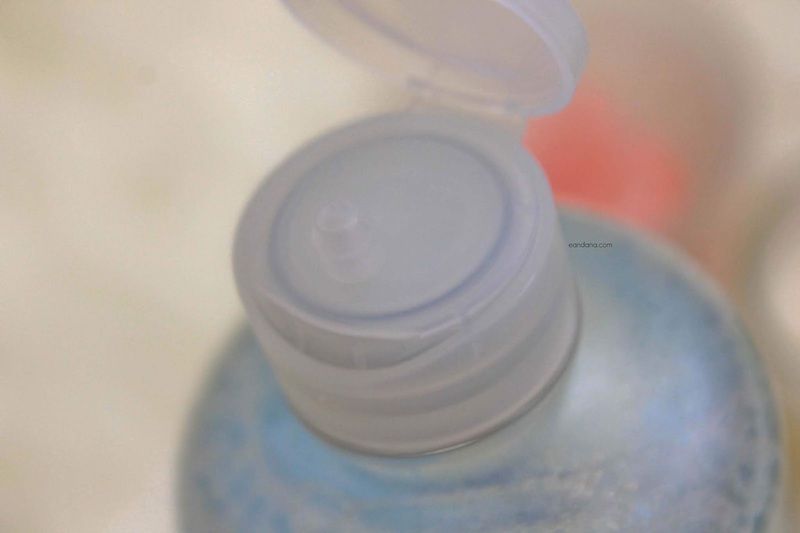 Remember to always use fresh solution – discard solution from lens case after each use. 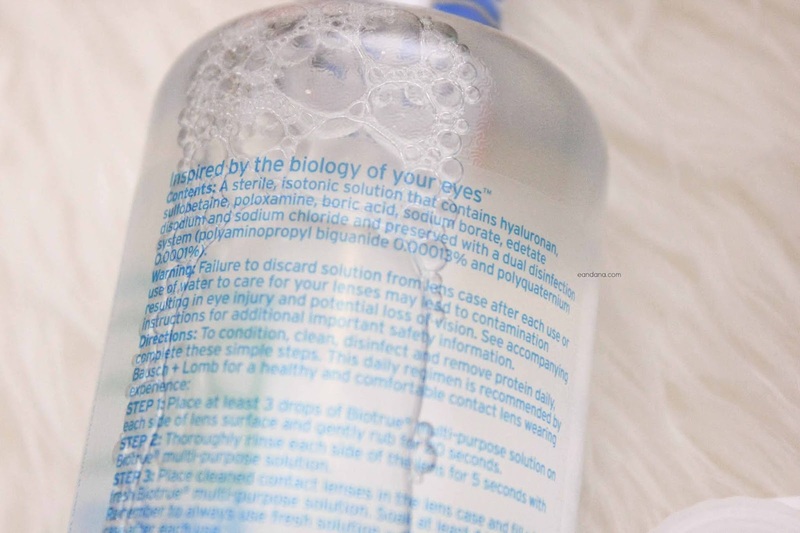 teteskan paling sedikit 3 tetes Biotrue ke contact lens (tiap sisi ya) dan bersihkan secara perlahan selama 20 detik. Cuci tiap sisi selama 5 detik dengan cairan. 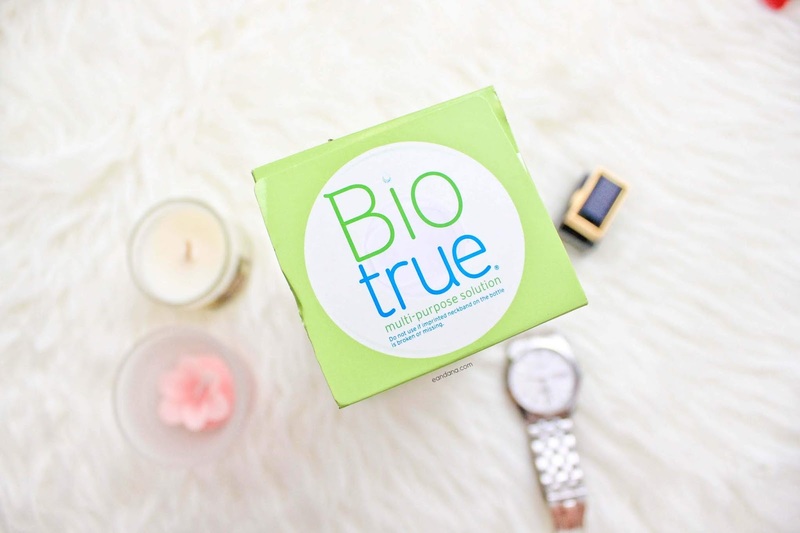 Taruh contact lens yang bersih di wadah dan isi dengan cairan Biotrue. Jangan lupa untuk selalu ganti cairan tiap kali pemakaian. Jujur dulu waktu lihat produk ini di Watson/guardian gitu, first impressionnya lucu banget warnanya, hijau. Dibandingkan dengan merk lain yang seringkali menggunakan warna biru di packagingnya, warna box produk ini standout banget. Sekalian, waktu itu lagi ada diskon dan setelah aku quick search reviewnya di google, semua bilang bagus. Oke, yakin deh pas beli. Seperti biasa, dapat wadah kontak lens kosong di dalamnya, dengan warna senada, putih – hijau. Poin yang bikin wow lagi adalah, botolnya berupa plastic bening. Kelihatan banget cairannya bening, bersih. Bagian tutup botol pun ada segelnya, aman. Dari segi pemakaian, aku udah pernah coba untuk teteskan di pagi hari, dan aman aja tuh mataku tetap lembab sampai jam 7 malam, tanpa aku teteskan cairannya lagi. *disclaimer : tingkat kelembapan ini akan tergantung juga dari contact lens yang kamu pakai ya*. Jadi, untuk masalah kelembapan ketika dipakai, sangat amat nyaman dan lembab! Saking cintanya, aku beli juga versi mininya, supaya praktis. 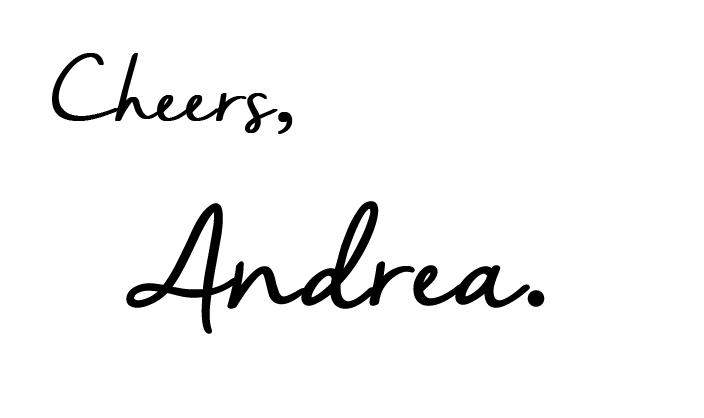 See you soon on the next post! Semoga dalam keadaan yang baik selalu. Untuk makeup yang natural – dipakai sehari – hari dan andalan saat bangun kesiangan, aku bergantung ke eyeliner. Tanpa eyeshadow, tanpa mascara, hanya eyeliner + concealer. Kadang ga pakai produk alis juga karena alisku sudah tebal, hahaha. I hope you are in a good mood! For a more natural and daily look, eyeliner is my ultimate savior especially when I overslept and do not have a lot of time in the morning. Usually I skipped eye shadow, skipped mascara, put only eyeliner + concealer. I sometimes did not even bother to do my eyebrow because I am lucky to have such a thick eyebrow. Eyeliner is a savior in a rush! Untuk bagian mata, dengan eyeliner saja sudah bisa kasih efek lebih segar. Walaupun penggunaannya tricky. Kalau waktunya ga keburu, aku punya eyeliner crayon untuk siap siaga, ini nanti akan aku bahas terpisah ya. Kali ini aku mau fokus ke empties eyeliner Wardah EyeXpert optimum hi-black liner terlebih dahulu. For decorative in eyes area, the use of eyeliner help brighten my eyes and make it looks popped. Even though I must admit that eyeliner is tricky, if I really run out of time, I put a crayon eyeliner instead of pen, but I will review it later on. 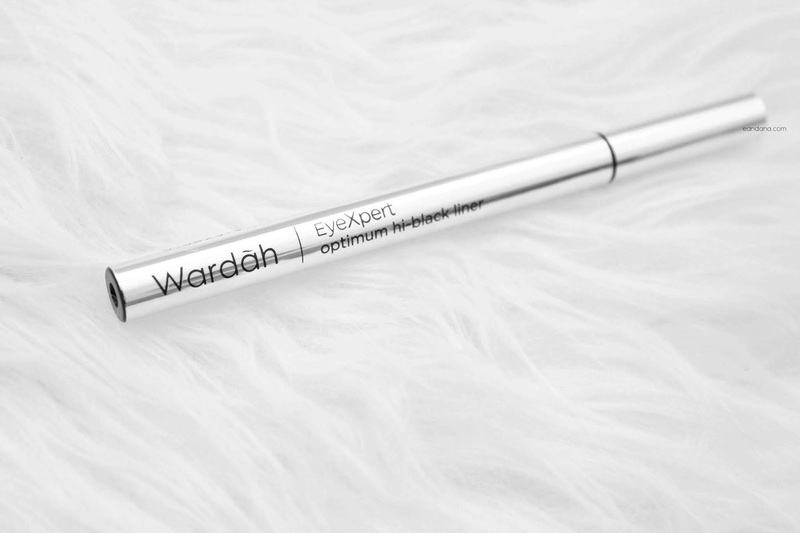 This time I want to focus on my empties series of Wardah EyeXpert optimum hi-black liner, first. Awalnya tertarik produk ini karena banyak dengar review bagus. Kebetulan mampir di drugstore dan memang rejeki anak sholehah, ternyata diskon. Belinya sekitar 50ribu, normalnya mungkin sekitar 70ribuan. Sering lihat e-commerce atau drugstore terdekat ya, biasanya sering ada diskon kok. What makes me interested in this product is because I heard a lot of good review from another blogger. Then I happen to visit nearest drugstore and seen this on discount, lucky me. I bought it around IDR 50k, normal price will around IDR 70k. I recommend to check e-commerce or drugstore to see special discount. Packaging tanpa kotak. Hanya ada segel plastic yang jika dikelupas maka keterangan yang tercetak di segelnya akan hilang. Keterangannya berkisar logo halal Majelis Ulama Indonesia, Ingredients dan profil perusahaan. 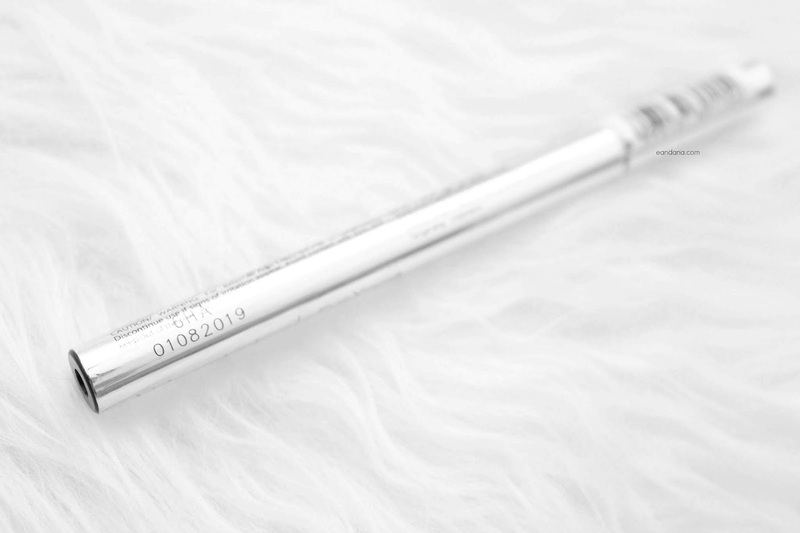 Bentuknya seperti pulpen dengan tutupnya, berwarna silver dengan tinta hitam. Kalau masih baru begini terlihat keren deh dan classy ya. Setelah ditarik segelnya, ada tulisan expressive, consistent, long-wear, nama produk dan tanggal kadaluwarsa. Nanti kita lihat ya apakah kualitasnya sesuai dengan apa yang tertulis. The product comes without box, but plastic sealed instead. 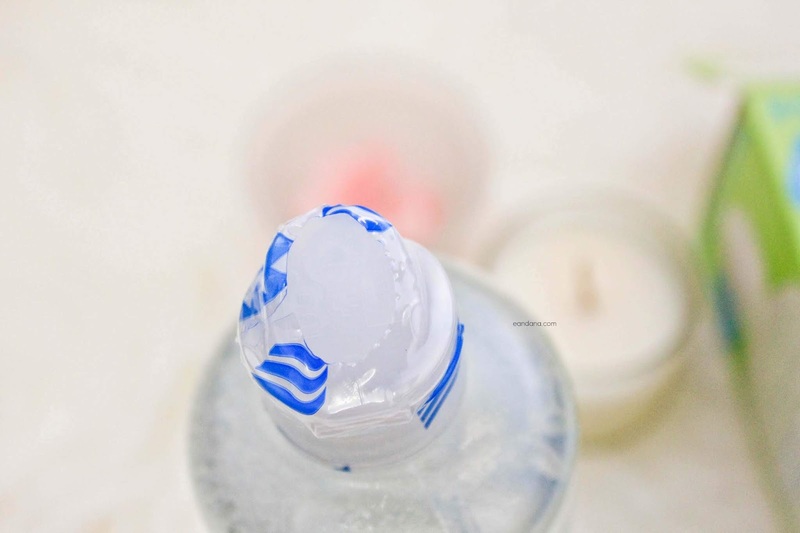 When the seal is torn, the printed halal logo, ingredients, company profile and caution of usage that printed on the seal will be gone as well. 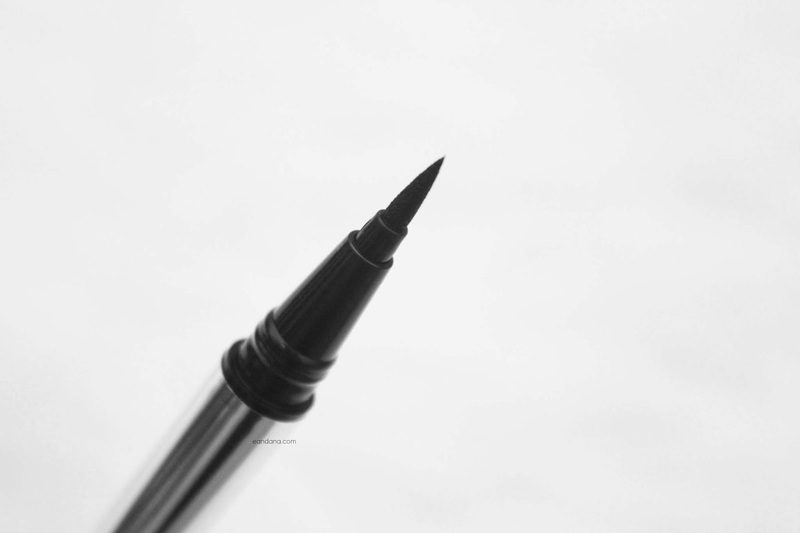 The eyeliner is in marker shape, silver colored with black tint. Looks cool and classy. After the seal is torn, you will see clearly their jargon “expressive, consistent, long-wear”, the name of product and expiry date. Let’s see if the jargon meets the quality. Seperti yang aku bilang di atas, karena keterangan ingredients ada di segel, awalnya aku santai buang segelnya setelah buka. 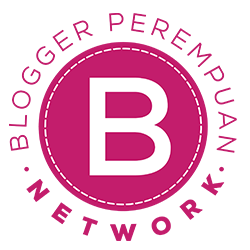 Ingredients biasanya ada di website kan? Jadi rencananya aku mau ambil datanya dari website resmi wardah aja. 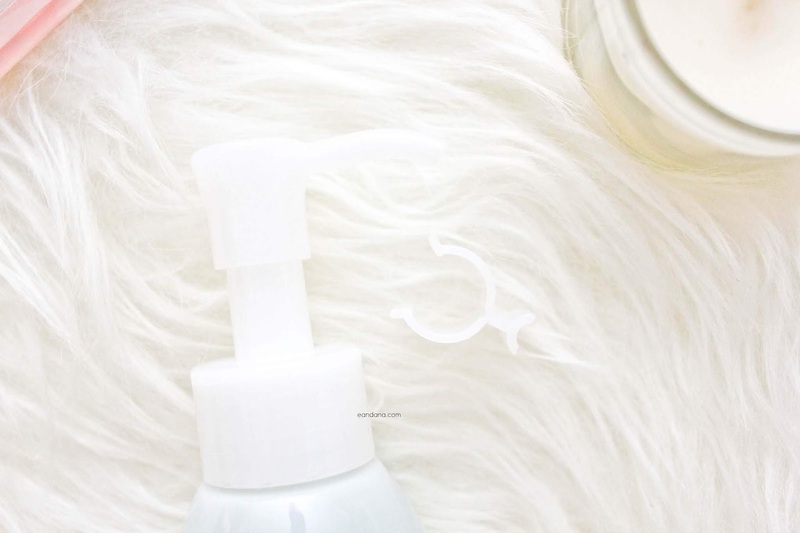 Sedihnya di hari aku tulis review, produk ini nggak aku temukan di https://www.wardahbeauty.com . Aku coba googling ingredientsnya juga gak ketemu. Siapa tahu saat kalian buka websitenya sudah muncul produknya, then please kasih tau aku dengan komen di bawah ya, supaya aku tambahin. Sementara aku kasih capture dari segel yang sempat aku foto. 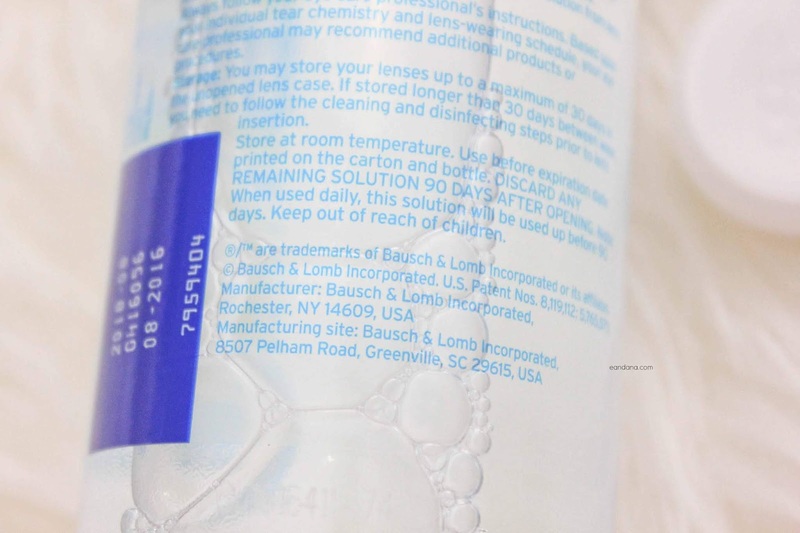 As informed above, because the ingredients is on the seal, I did not think twice to dispose the seal thinking that I will copy the ingredients from their official website. It is such a pity that on the day that I wrote this article, this product is not listed in https://www.wardahbeauty.com . I tried to googled it as well and found none. By the time you read this if you happen to found out that it already listed, please tell me on the comment section below so I could complete it! Enggak ada bau aneh selama penggunaan. Happy that there is no particular scent. Brush nya seperti spidol, ukurannya juga termasuk “pas”. Enggak sakit saat digunakan, lumayan fleksibel. 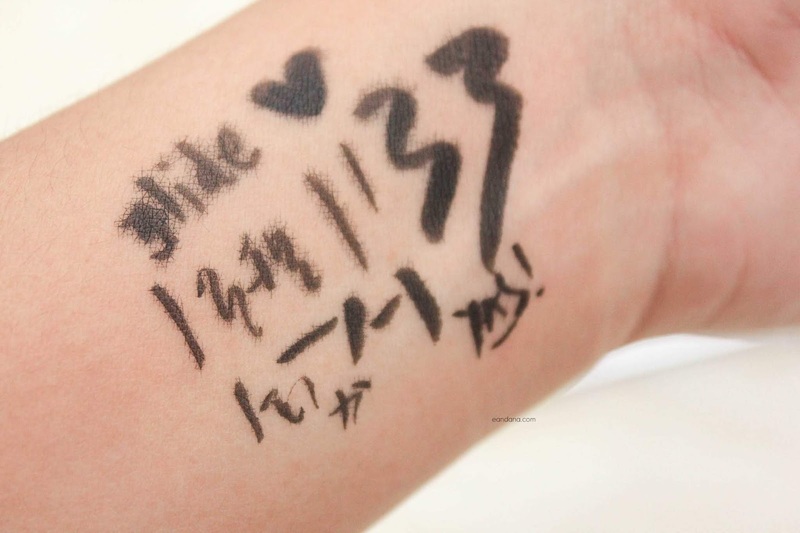 The brush is not something like a felt tip Japanese product, but more like a marker. Size is just fit, comfortable to use and flexible. Eyeliner Pigmentation is pitch black! Pigmentasinya tergolong baik. Sekali swipe, warna hitamnya pekat, konsisten dan cepat kering dengan hasil akhir satin yang agak mengkilap. 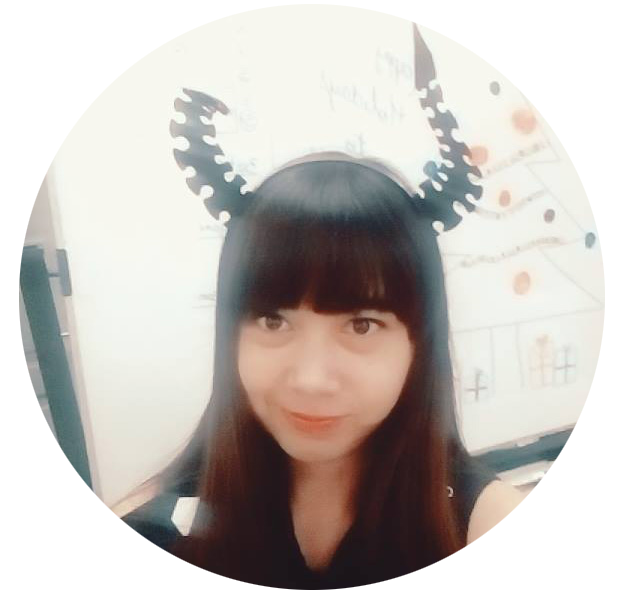 Di bawah ini image hasil eyeliner ini ya. Garis yang tipis maupun tebal lancar banget. I like the pigmentation. Within one swipe the consistency of black color is strong, quick to dry with satin finish. Glides smooth both in thin and bold strokes. Untuk smudge test, sayangnya setelah digosok pelan warnanya memudar. Tapi ya, kalau dipikir kita kan jarang gosok bagian mata dengan kencang ya. Hindari gesekan di bagian mata ya, saat pakai eyeliner ini. Waktu wudhu juga usahakan jangan terlalu menggosok bagian mata. Smudge test, apparently it is starting to gone when I rub a little bit. I know in real life we will not easily rub our eyes so often, but still, better avoid to rub eyes area when using this product. Di bawah ini adalah hasil setelah diberi air dan di gosok sedikit. 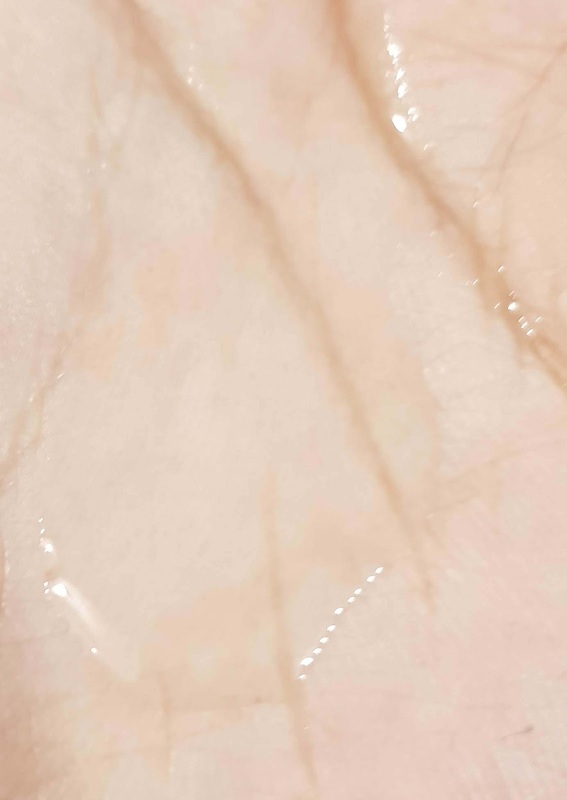 Below is the result of water test and a lil bit of rubbing after. Karena ini review empties, aku jelasin hal yang aku rasakan ya selama pemakaian. Karena aku sudah berhasil menghabiskan eyeliner ini, hehe. Nantinya setelah penggunaan jangka panjang, warna silver di packaging akan hilang, seperti mengelupas gitu. Kalau sudah mengelupas, aku agak gemes ngeliatnya. Kesannya kayak kotor gitu, haha. Since this is empties series, I will explaining thoroughly based on my experience. 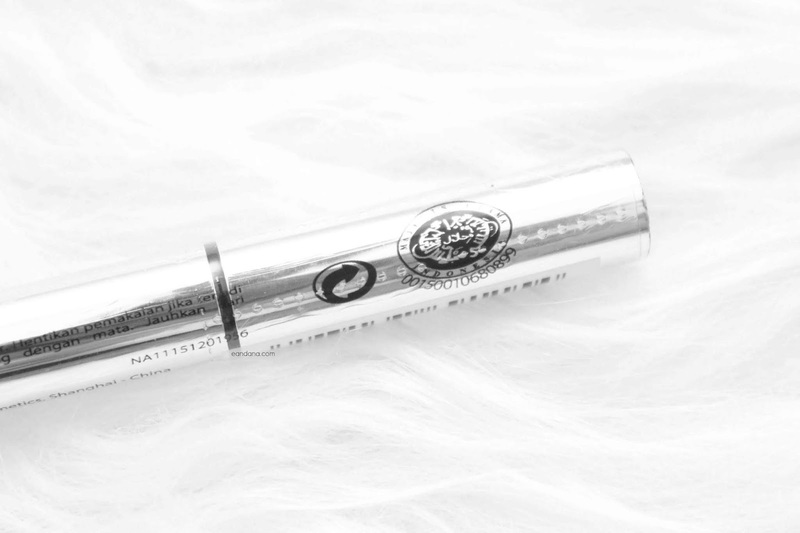 After a long usage, the silver color on the packaging will start fading away. It is not gonna nice anymore, and slightly starting to wish it comes in black color packaging instead. Kelopak mataku bukan tipe yang berminyak banget, tapi juga enggak kering ya. Mungkin tergantung aktivitas hari itu. Biasanya kondisi aku adalah di ruangan AC kantor + ruangan AC juga di rumah. Sisanya cuma di perjalanan menuju kantor dan pulang kantor aja yang agak panas, dan ditambah jam istirahat. Aku biasa apply eyeliner di kantor, mungkin sekitar jam 9 kurang lah di pagi hari. Lalu sampai di rumah sekitar jam 8 malam, kecewa karena ada smudge hitam di bawah mata. Seperti lelehan eyeliner di bagian kantung mata. Memang bagian kelopak yang di bubuhkan eyelinernya masih oke, gak ilang banget. Tapi ya itu, kayak mata panda, gengs haha. Ini juga terjadi saat wudhu, aku hati – hati banget untuk ga gosok bagian mata, setelah wudhu pasti ada lelehan mata panda itu. Jadi aku kalau pakai eyeliner ini agak insecure, bawaannya mau lihat kaca untuk cek apakah tintanya mbleber ke bawah mata. Mungkin kamu bisa pakai eye base dulu sebelumnya untuk mencegah hal ini ya, tapi aku biasanya pakai eyeliner ini tanpa eye base. My eyelid is not the oily type, but not that dry either. Maybe it will be depends on my activity. But in usual condition I will be mostly in AC, indoor. Humidity only strikes in the way home after work plus office break. Applied it at the office around 9, arrived at home at 8 pm and disappointed to see a faint black mark linger on my lower part of eyes. Mind you, I only put it on upper eye lid, and it is still good. It only the lower part of my eyes that I am worried about. I have gone insecure and constantly checking on mirror to see if it is smudged. Maybe you should put eye base before putting it, and this review is made without any eye base on my lid. Setelah pakai beberapa bulan, tutupnya jadi agak susah klik. Ini juga aku khawatir mbleber di pouch. Lalu tintanya kering J Sedih, haha. Berakhirlah sudah perjalananku dengan eyeliner ini. After several months, I had difficulties to close the lid properly. This, made me worried, I did not want to ruin my pouch. And then the ink is dry….. *cried. Finally my journey with this product approached the end. Aku tahu banyak yang cocok pakai eyeliner ini ya. Dengan kondisi yang aku jelaskan di atas, sayangnya produk ini kurang cocok di aku karena lelah mengecek dan membersihkan smudge yang ada di bawah mata. Aku menghindari banget gosok bagian bawah mata, karena area ini sensitive dan tipis. Aku memutuskan untuk tidak repurchase produk ini. Semoga review aku di atas bisa menjadi masukan untuk produk wardah selanjutnya ya, aku suka beberapa produk wardah lainnya kok, hanya saja ekspektasiku mungkin berbeda dengan teman – teman lain untuk produk ini. I know a lot of people likes this eyeliner. But for me, with things I described above, it is such a pity that this product did not satisfy my expectation of eyeliner. I grew tired to check and clean the smudge on my eyes, plus I avoid to rub eyes area because that part is fragile and sensitive. I decided to not repurchase this product, I hope my review above can be considered as one of the things that can be improved in the future for the product itself. I will be back soon on my next post!